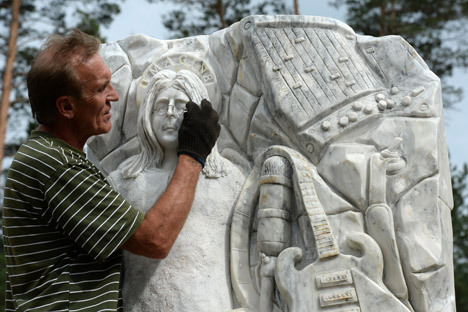 A sculpture of John Lennon will appear this summer at the "Turquoise Katun" tourism economic zone in Russia's Altai region. The late former Beatles musician will be made to look like Jesus Christ by the sculptor Vladimir Voychishin. Lennon stands on a plastic spiral in the monument. Besides the musician, there is also a guitar, microphone, speakers with graphic equaliser and a large beetle at the bottom. On the reverse side, there is a piano with a portrait of the musician’s widow Yoko Ono. At the bottom there is a beetle, which rolls rock’n’roll around the world. There are many sculptures of the famous “Beatle” all over the world, but this is the only one made of marble. A foreign ministry spokesman in Altai recently sent an invitation to the unveiling to the UK embassy but has not had a response. The artist doesn’t expect an embassy representative to come. Voychishin started his journey as a creator when he visited the United Arab Emirates and made a Kalashnikov rifle from precious metals. He has lived in the UK, Canada, USA, Kenya, Germany and Argentina. In almost every place, he has organised exhibitions and made sculptures. His works are in personal collections of Hugh Grant, Celine Dion, and Fidel Castro. Now he wants to create the world's first gallery in the mountains. Lennon's monument will be the first piece of it.